Songs from the “First Lady of Song” which may surprise you. 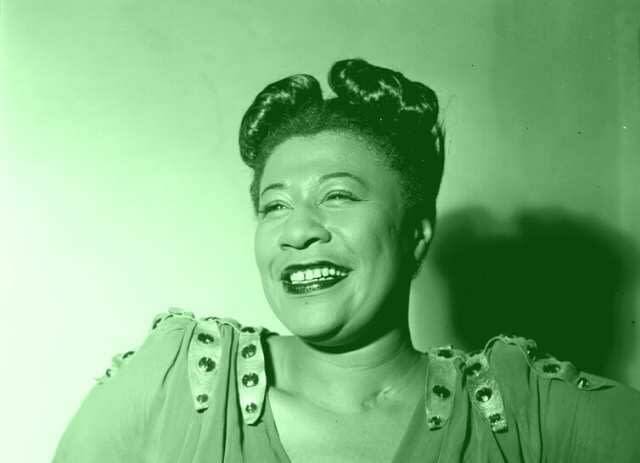 “The First Lady of Song” Ella Fitzgerald would have turned 100 on Tuesday, April 25: institutions from the Library of Congress to the Grammy Museum will be honoring her amazing contributions to the jazz canon. In the 1930s – just as Fitzgerald was getting her start – jazz was under fire for its purported ties to drug culture. The 1936 anti-drug film “Reefer Madness” featured party scenes of young people listening to jazz and ragtime while smoking marijuana. A year later, Harry Anslinger, the commissioner of the Federal Bureau of Narcotics, published “Marijuana, Assassin of Youth,” which pinned the use of drugs on a culture of unscrupulous partying – with big band jazz as its soundtrack. It was a song that perfectly encapsulates Fitzgerald’s girl-next-door image. It opens with Webb leading the orchestra through a stock series of simple chord changes. When Fitzgerald enters, listeners are treated to a reworked nursery rhyme that asks little of them other than to sit back and enjoy. There is no moral value, no hint of the singer’s inner life and no mention of drug use. In fact, “A-Tisket, a-Tasket” is barely jazz. As with Benny Goodman and so many other bandleaders in the late 1930s, Webb and Fitzgerald seem more interested in creating a pop tune that fit the 78 RPM format than in staying true to their genre. Yet it became so popular that she and Webb recorded a follow-up track, “I Found My Yellow Basket,” that same year. But then – just a few months after “A-Tisket, a-Tasket” – Webb and Fitzgerald recorded “Wacky Dust,” a song about the allure and dangers of cocaine use. The release of “Wacky Dust” coincided with a massive shift in cultural opinion taking place in the U.S. about the use of drugs like cocaine and marijuana. Once a relatively uncontroversial social issue, drug use in the 1930s increasingly came to be seen as a societal ill that was especially (and incorrectly) tied to African-Americans and jazz musicians. Even sympathetic artists couldn’t help but buy into the stereotype. George Gershwin’s operatic adaptation of DuBose Heyward’s novel “Porgy,” for example, was revolutionary for its diverse cast, but the story, written and adapted by two men of European descent, reinforced the popular perception of prevalent drug use among African-Americans. In 1933, Cab Calloway’s “Reefer Man” was used in the film “International House.” A year later, Benny Goodman released “Texas Tea Party,” a reference to both marijuana and to the trombonist on the recording, Jack Teagarden. These were not subtle works, and most jazz artists of the era produced what have since become known as “reefer songs.” Even Louis Armstrong – who, like Fitzgerald, cultivated a rather benign image – was arrested for smoking marijuana and recorded several tunes that allude to drug use.